I'm desperate to find Aquitania's log book for 1941...any ideas? Responding to Bert and Caroline Grover: My mother arrived on the Aquitania on July 2, 1926. I was able to find the ship manifest with fabulous information on it at the National Archives in Washington , DC. It helps if you know the exact date of arrival. That made the search pretty easy, about a 45 minute effort. How wonderful to find this website – have been looking for some time (to get Canadian OAS benefits). I arrived as an infant with my R.A.R. father and English mother (both deceased) in Halifax on Feb 14th, 1945. Is there any way to get a passenger list. The immigration way of obtaining a “Certified True Copy of Landing” currently has a wait-time of 34 weeks. What a neat site. My mother and I travelled from England to Canada on the Aquitania. There is a woman in England who is recording all of the passenger lists as they are aging badly. I have received a copy with my mother and me listed on it. I think I paid about $15.00. This was several years ago. At this very moment I can't locate my file so over the next few days I'll see if I can find her address, email, etc and I will repost this information as I see several of the immigrant toddlers - just to become pensioners - are anxious to verify their date of entry. I am responding to messages dated Sept. 7,2007 by Trish La Plante and Dec. 14, 2006 by J. Siderius. I also arrived on the Aquitania with my parents on Mar. 14, 1949 in Halifax. And I am also looking for a passenger list and any photos or stories from that journey. I was born in 1947 in Diddington, England. Hope to hear from fellow travelers. Thanks for your web site. I have in my possession a b/w photo embedded in glass of the AQUITANIA. This picture belonged to my great grandmother who is said to have been a crew member of this ship. Fanny Maria Schwank, born on September 26, 1874 was a finnish citizen. The Finnish Institute of Migration has listed her name on a passenger list on April 27, 1912. Up to this day I have believed she embarked the Aquitania on that day. However this cannot be correct as the maiden voyage to N.Y. departing from Southampton took place in May 1914. If she really was part of the crew she must have been on one, or all of the three departures that took place before the ship was turned into the war service of WWI. Fanny Schwank was back in Finland again in 1915, so she cannot have been serving as a crew member during the war, just on those first three crossings. It is also known that she lived permanently before that time in Brooklyn N.Y. for some years. That explains her name on the above mentioned Migration list in 1912, on whatever ship she may have gone. As there are no living people around anymore to give even the smallest hint I would greatly appreciate any possible information you would be able to give me on this matter. I hope, if possible, someone to look into the crew member lists of those three voyages in 1914, either departing from Southampton or N.Y., because at that time she might have been living in N.Y. City and not in Finland. I am looking for a passenger list for the Aquitania, departing from Southampton, England and arriving in Halifax approximately Sept 16, 1948. I need this information for my OAS (Old Age Security Pension). My sisters and I are not listed on our mothers landed immigrant papers for some unknown reason and need to prove we were with her on this voyage. Can anyone assist me? Canadian citizen or an individual present in Canada. of the gravestone showing name and death date. Fee: $30.00 for a certified copy for legal purposes. If you do not require a certified copy, you can submit your request on a Personal Information Request Form at no charge. Copies of Access to Information Request Forms and Personal Information Request Forms can be obtained from most Canadian public libraries and federal government offices. James Rumsey, was also a waiter on the Aquitania from 14/1/46 to 16/11/46. I would be grateful for any information. As a family we were Emigrating from the U.K. to Canada in July 1948 aboard the R.M.S. Aquitania. The crossing was not to be uneventful and it must have been some 3 days out when one of the British Emigrants – A man I suppose in his late 30's early 40's suddenly died from a ruptured (Totally unknown) Duodenal ulcer. Now the Stewardess in the female Quarters on C Deck submitted that a ship NEVER finished a crossing without a full compliment and lo and behold the following Morning EARLY I was to be wakened by my father and told to hurry to the upper deck where we were to witness the transfer at sea from a freighter, a seamen who had appendicitis. at that time was Alice Roberts and my son's name was Michael. My grandfather was transported on the Aquitania on April 2nd 1918, headed for England. Here is an excerpt from his diary: April 1918 1) We moved over to different barracks in the morning. We got our orders to move late in the afternoon so they had another inspection. They had us up all night drawing what we were short in equipment. All I got of it was a pair of gloves and a pair of shoe strings. We rolled our packs and carried out barrack bags to the station about 2:30 AM. 2) We, the 315 of the 375, left the station on the train about 6 AM getting to the Hoboken docks about 8 o'clock and stood around on the pier till nearly noon. A ferry came and took us over to where the Aquitania docked. She is "some scow". We were checked off and given a meal card and bunk number and run up the gang plank. She pulled out about ten minutes later at 12:10 PM. By night we were way out of sight of land. I have a fairly good bunk. Some of the fellows drew regular state room. Spent the afternoon looking the boat over as much as I could. Chris Adams on the 8th deck. We call it the "death pit". I'm on "E" deck. What I am looking for is a passenger list or something like that that would prove that he was onboard her. His name is/was Robert Peal Dunphy. for Halifax, from where we immediately made our way to P.E.I. the first time I'll return to Halifax (by sea of course), to celebrate 60 years since that wonderful crossing on the Aquitania. However I'll be celebrating my 66th birthday onboard. Anyone with any memories or info on the crossing, Southampton - Halifax? Sept. 1948? My father, William Sullivan, was a stoker on the Aquitania during WW1. I have a photo of him and his crew mates. I recall only a few things that he spoke of. He talked about taking Yanks into battle, but he didn't like them much. I think he mentioned a collision with another vessel and nearly cutting it in half. 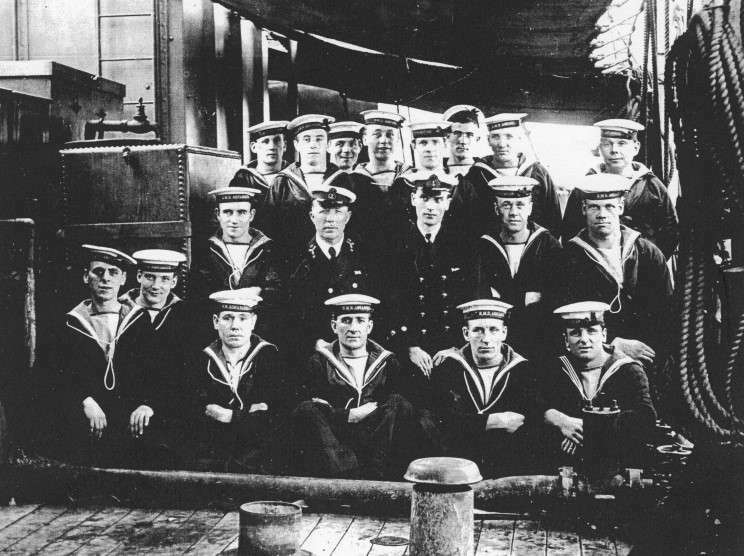 Crew of HMS Aquarius, William Sullivan is in the back row, second from left. We live and learn. On closer inspection I can see that the name on the headgear of the sailors is not HMS Aquitania but HMS Aquarius. However, I am not wrong about my father serving on the Aquitania. He was a simple stoker. He and the family spoke of it many times (although details are hazy) and my random searches have confirmed that information that I have known for many years. There was a large photo in my home when I was a child and I'm sure (I think) that that did bear the name of Aquitania. I'm English born, living in Australia, but my family, all older than me, are still in England. Not much chance of information from home. Apr. 5/46. I believe Lord Alexander was on the same trip to become GG of Canada. Have others had success, if so, how do I go about my search? If you have no success with Pier 21, you can contact Ms. Debbie Beavis at e-mail: marine@beavis.co.uk . Give her your Father's Regimental Service Number and rank, (if you have it), your Mother's name and your name, and she will research the passenger list for the crossing of the Aquitania that took place 5 April - 10 April 1946. There will be a (small) charge for this service. I am trying to locate a passenger list for the Aquitania which left Southampton, England in December 15, 1947 for Halifax, Nova Scotia. Does anyone have a copy their willing to share or any information relating to this sailing? Great site, Michael. I hope you're able to expand to other ships coming into Canada. I'm also trying to find out how to get a name of a ship and the passenger list of that ship which supposedly came around the Cape Horn from Europe and landed in Vancouver in 1910. That's all the information I have to go on. Thanks in advance for any help. Thank you for the wonderful links to Aquitania history. My father's family (parents, him and sister) came from Holland (Nederland ) to the United States in 1950. I want to find out more but I believe that his trip was one of the last crossings of the Atlantic to the United States before the lady retired in Nova Scotia. Thanks for putting images and history to our Aquitania respect and reverence. It gives me great pleasure to be able to add my comments to this wonderful RMS Aquitania website. 11-29-47 my Mum, Claire Devlin Blackley, Auntie Kathleen Devlin, my wee sister Claire Devlin Blackley & myself, Francis Rafferty Blackley, Jnr., sailed from Southampton to Halifax, NS arriving on Dec. 3, 1947. We could not disembark until the following day, Dec.4, the reason being Aquitania had a list to port and we were leaving starboard side to. I was 7, dressed in a kilt and Glengarry with a smattering of snow in Halifax Harbour. It was rather chilly, but we Scot's are tough. We left Bo'ness, Scotland via Digby, Lincolnshire (RAF BASE) then continued on to London & Southampton for our fantastic voyage. 5 days of North Atlantic Storms. I think Mum, Sis & I were the only ones that appeared for the 3 meals clumsily served in the huge vacant dining hall. I have fond memories of running amok all over the ship with my 10 year old pal Alex Henry who was traveling to Vancouver, BC with his Mum who was a war bride with 5 children. We traveled by train Halifax- Montreal- Toronto and our destination, London, Ont. This Thursday Nov. 29 is our 60th anniversary and I am celebrating by building a model of RMS Aquitania, but using a Lusitania model. Couldn't find Aquitania anywhere. No one will know, except you & I. Thank you Michael, I really appreciate this space. My parents, Jack & Jean Kipling, knew Pat Fagan and I would be happy to share information with Ms La Plante if she wants to contact me. Please feel free to give her my email address. I am looking for a photo from January 8, 1936 that shows the Triple Crown winning racehorse Omaha being loaded onto the Aquitania for a trip to England to run in the Ascot Gold Cup later that year. The particular photo that I am looking for shows Omaha along with trainer Sunny Jim Fitzsimmons and a groom (Jim Ahearn). out of a travel agency of the fifties. I have always been curious when exactly the ship was built and now know, thanks to your website. This will definitely increase my appreciation of our picture. With delight, by chance I came upon your web site and found the information on the ship Aquitania very interesting. I believe that is the ship that brought my Mother to the United States in 1926. I have been desperately searching for any record of my Mother arriving in New York, Ellis Island. From all the information I was able to compile on her I am led to believe she left Cherbourg, France on April 1, l926 and arrived in New York April l0, l926 on the S.S. Aquitania. Her name was Johanna Louisa Hangartner - born March 28, l903 - white female - born Alstatten, Switzerland, Father was Josef Anton Hangartner - she came to America to get married. Where could I find information regarding the Manifest for this particular date? I would be very grateful for any information you would be able to give me. Am trying to find out if Aquitania was ever mentioned in any of Dame Agatha Christie's stories. If you know please reply j4360g@hotmail.com. Many thanks from me and the veteran who wants to know. I am trying to find the passenger list for the Aquitania arriving at Pier 21 Halifax March 14th 1949. Just wondering if anyone has a copy or knows where I could find one.